Editor’s Note: These short reviews of a recent paper in the Journal, written exclusively by graduate students or postdoctoral fellows, are intended to mimic the journal clubs that exist in your own departments or institutions. For more information on the format and purpose of the Journal Club, please see http://www.jneurosci.org/misc/ifa_features.shtml. Habits and compulsions have long been thought to relate to drug addiction. On the one hand, the increasing negative consequences faced by drug-taking addicts have led to the characterization of addictive behavior as compulsive, and the development of addiction has been hypothesized to involve the progressive control of drug taking by inflexible habits (Everitt et al., 2001). More broadly, drug addicts are also more likely to develop obsessive compulsive disorder and often display elaborate and repetitive stereotypical behaviors that are not exclusively drug related. Conversely, people who have obsessive compulsive disorder have a higher risk of developing addiction, which, according to one intriguing report, can further increase dramatically after psychosurgical lesions that include the ventral striatum and the prelimbic prefrontal cortex (Irle et al., 1998). The striatal dopamine system has been extensively implicated in the development of habits and addiction. Because repeated administration of drugs of abuse can lead to an increased responsiveness of mesolimbic and nigrostriatal dopamine systems (sensitization), and because dopamine may drive the learning that underlies instrumental conditioning through enabling striatal plasticity, repeated self-administration of drugs of abuse could accelerate the formation of habitual drug-taking behavior. In their recent Journal of Neuroscience paper, Nelson and Killcross (2006) investigated the effect of amphetamine sensitization on the development of habitual instrumental responding for a natural reward. In instrumental conditioning, the response is initially controlled by a goal-directed process in which the instrumental behavior is sensitive to the motivational value of the outcome. With overtraining, behavior comes to be dominated by inflexible stimulus–response associations. This transition is marked by the appearance of insensitivity to outcome devaluation when tested in extinction (Balleine, 2005). Nelson and Killcross induced amphetamine sensitization in rats over 7 d by daily injection of 2 mg/kg d-amphetamine or saline. During the subsequent 7 d, the animals were left undisturbed except that they were reduced to 80% of their ad libitum weight. After that, the rats were trained instrumentally on a random-interval schedule over 5 d in either the morning or afternoon. At the other time of the day, an alternative reinforcer was presented noncontingently on a matched random time schedule. The reinforcers used were maltodextrin solution with a cherry flavor and sucrose solution with a grape flavor. Next, either the instrumental reinforcer (devalued group) or the alternative reinforcer (nondevalued group) was presented noncontingently in the operant chamber followed by injection of lithium chloride for the devalued group and saline for the nondevalued group. Finally, a short extinction test was conducted. The second experiment was essentially a repeat of this design, except that the induction of sensitization and the conditioning sessions were reversed, to control for the effect of sensitization on devaluation. The results clearly show that amphetamine sensitization accelerates the development of habits in instrumental training while having no effect on the devaluation procedure itself. In the saline-injected rats, devaluation produced a significant decrease in lever pressing during extinction, whereas in amphetamine-treated rats, devaluation produced rates of lever pressing that were similar to those of the nondevalued group [Nelson and Killcross (2006), their Fig. 2 (http://www.jneurosci.org/cgi/content/full/26/14/3805/F2)].Thus, the responding of saline-treated rats was still goal directed, whereas the responding of amphetamine-treated rats had become habitual. Induction of conditioned taste aversion in the devalued rats was confirmed by the reacquisition test, in which both amphetamine- and saline-treated rats responded less than the nondevalued rats [Nelson and Killcross (2006), their Fig. 3 (http://www.jneurosci.org/cgi/content/full/26/14/3805/F3)].The results from the second experiment confirmed that the effect of amphetamine sensitization was not the result of an interaction with the devaluation procedure, because induction of sensitization after instrumental training did not result in resistance to devaluation [Nelson and Killcross (2006), their Fig. 4 (http://www.jneurosci.org/cgi/content/full/26/14/3805/F2)]. An activity assay finally established that behavioral sensitization was indeed induced by amphetamine injections. These findings show that amphetamine sensitization accelerates the development of habitual responding in a task that is conducive to the development of habits by overtraining. It implies that dopamine transmission in the striatum may contribute to the development of habits, although no explicit evidence in support of this contention was presented. Sensitization is one way in which dopamine may influence instrumental behavior of addicts, but it is not the only way. Post-drug-administration increases in dopamine may strengthen antecedent responses, and subsequent responding for drugs will occur under elevated dopamine concentrations that might add to striatal plasticity. So what would be the effect of responding for drugs of abuse rather than a natural reward? After all, drug addicts, if anything, focus less on natural rewards and more on their drug of choice. It is possible that habitual responding develops even more rapidly with an intravenous drug of abuse, because a dopamine reuptake inhibitor can increase the phasic dorsal striatal dopamine response in rodents in vivo (Gonon, 1997). Thus perhaps responding for drugs in a drugged state could further drive habit formation, although an increase in tonic dopamine might continuously stimulate dopamine receptors with maximal efficacy. Furthermore, these results extend the understanding of the neural systems that mediate goal-directed and habitual responding and their relative balance. Goal-directed responding appears to depend on the prelimbic cortex and dorsomedial striatum, whereas habitual responding depends on the infralimbic cortex and the dorsolateral striatum (Balleine, 2005). Dopamine may be important for strengthening both forms of responding, but the present results imply that sensitization of nigrostriatal and mesolimbic dopamine systems favors the development of habits. These findings are summarized in Figure 1. Schematic representation of key structures for goal-directed and habitual instrumental behavior. In the prefrontal cortex (PFC), the prelimbic cortex (PL) is necessary for the acquisition of goal-directed action–outcome memory (A-O), whereas the adjacent infralimbic cortex (IL) is necessary for the expression of habitual stimulus–response-type learning (S-R) (Killcross and Coutureau, 2003). In the striatum, the posterior dorsomedial region (DM) is necessary for the expression of action–outcome learning, whereas the adjacent dorsolateral region (DL) is necessary for the expression of stimulus–response learning. Nelson and Killcross (2006) showed that sensitization leads to accelerated behavioral dominance of stimulus–response memories. This is the second report that implicates sensitization in the development of inflexible lateral–striatal-dependent behavior. 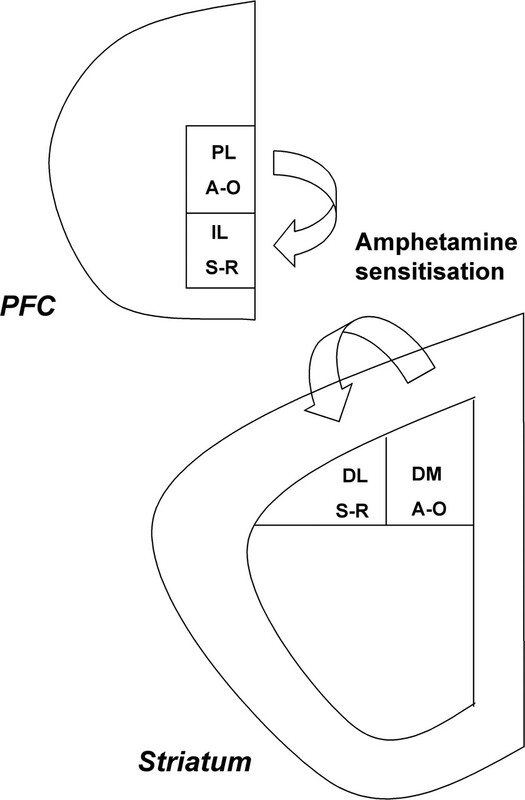 In a previous study (Canales and Graybiel, 2000), sensitization with amphetamine or cocaine resulted in increasing motor stereotypies after a later drug challenge. In that case, the relative immediate-early gene expression in striosome over matrix compartments in the lateral striatum correlated very strongly with motor stereotypy. Together, these results imply that sensitization is one important mechanism by which drugs of abuse can lead to focused inflexible behaviors that depend on the dorsolateral striatum. Balleine BW (2005) Neural bases of food-seeking: affect, arousal and reward in corticostriatolimbic circuits. Physiol Behav 86:717–730. Canales JJ, Graybiel AM (2000) A measure of striatal function predicts motor stereotypy. Nat Neurosci 3:377–383. Everitt BJ, Dickinson A, Robbins TW (2001) The neuropsychological basis of addictive behaviour. Brain Res Brain Res Rev 36:129–138. Gonon F (1997) Prolonged and extrasynaptic excitatory action of dopamine mediated by D1 receptors in the rat striatum in vivo. J Neurosci 17:5972–5978. Irle E, Exner C, Thielen K, Weniger G, Ruther E (1998) Obsessive-compulsive disorder and ventromedial frontal lesions: clinical and neuropsychological findings. Am J Psychiatry 155:255–263. Killcross AS, Coutureau E (2003) Coordination of actions and habits in prefrontal cortex. Cereb Cortex 13:400–408. Nelson A, Killcross S (2006) Amphetamine exposure enhances habit formation. J Neurosci 26:3805–3812.